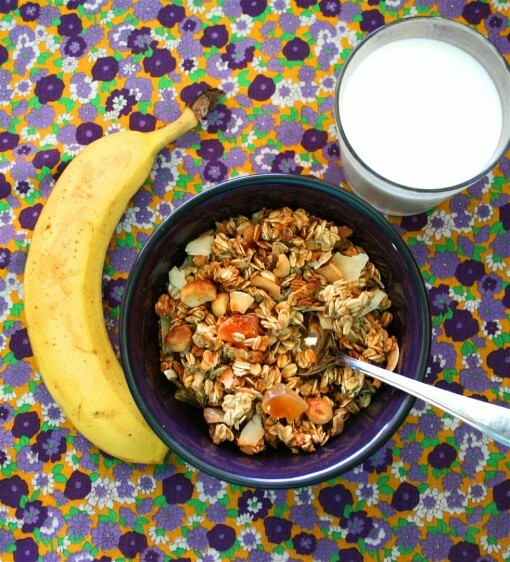 Tropical Granola (Oil-Free) was posted on July 6th, 2011 and is filed under Breakfast, Gluten Free, Recipes, Vegan. This entry has 14 comments. You can follow any responses through the RSS 2.0 Comment Feed. Recently we got some organic, unsulphured dried fruits from a woman who sells health foods in our area. I was excited to use them, so I dreamed up this recipe. I wanted it to be low in fat, high in fiber, slightly sweet (since dried fruits are already so sweet), and have a fruity flare to it. I really like how it turned out, it’s not a super crispy, chew-and-chew-and-chew, type granola (although I like those kinds too), because the applesauce (a great substitute for oil) keeps it from getting too crunchy. Store bought granola is not only super duper high in calories, it’s high in fat (not your good fats! ), and it costs a lot…I’d much rather make my own healthy version! This is oil free, and sugar free, and if you want it to be vegan simply swap out the honey for more agave nectar. For gluten free, make sure your rolled oats say “Gluten Free” on the packaging. To me, all that adds up to great breakfast…with a little added protein, of course! Eat this with Greek Yogurt to get a good bang of protein to start the day. Preheat oven to 350 degrees. Mix up the dry ingredients (oats, coconut, spices, and nuts). Add all the wet ingredients to a medium sized bowl and combine. Chop your dried fruits and set aside. Place parchment paper on a large baking sheet. 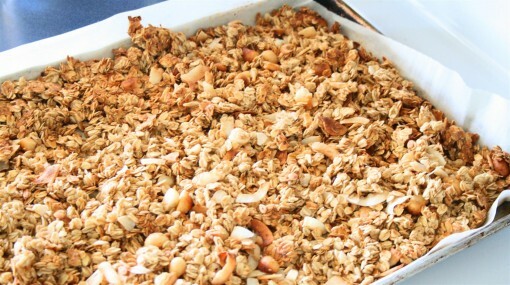 Pour the granola mixture onto the sheet and place in the oven for about 30 minutes. Because every oven is different, keep checking on the granola to make sure it doesn’t burn. At the 30 minute mark, turn over the granola and keep baking until it’s a golden brown. This should take about another 15 minutes. 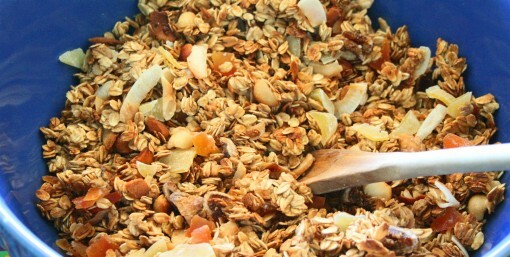 Pour the granola into a big bowl and add the dried fruits. I ate it warm with almond milk for my lunch after I made it. Actually, we all did. Nice to know that I’m not the only one who doesn’t have patience for it to cool. This serves 10-12. I’m loving summer so much…it seemed like for weeks on end it was just raining, and now I feel that summer is “being summer” properly. You know…not raining! It’s been so great to see our square foot garden growing, work outside, and enjoy the sun on my face. But somehow, summer always tends to be the busiest time of year for our family and the band…so it’s always a bit of a struggle to fit my workout in. But I find that if I get up early, I can squeeze it in. It seems like if I wait till the afternoon, there’s just no time for it anymore. I am so not an early bird, but I’m trying to become one…it makes the day so much more productive! If you want to keep updated on all my posts you can subscribe here! What time of day do you usually fit in your workouts? Do you like to make your own granola? Yes, it sure is good!! Enjoyed it so much for my lunch yesterday!! Oh this looks really tasty! And I love the name “Tropical Granola” – it fits! I like granola but like you said, it isn’t always the healthiest thing depending where & what you buy. And I absolutely love dried papaya, I always keep a stash at my desk for emergency munching. I don’t think I’ve ever had an oil-free granola! I’m surprised the applesauce doesn’t take away from the crisp, but I guess that’s the oven’s job. Looks beautiful! This is pretty as well as looks delicious! Gorgeous granola. This looks delicious and a perfect way to start my day. It looks delicious, I’ll try some similar this weekend!! You’ve done it again. I need some oil-free granola. Love it. That looks amazing! I might try that when the weather here down under warms up. Hey just wondering how big your serving sizes are– 1/2 cup? Aly~ I divided the recipe into 12 servings, but I didn’t measure it out. But it was definitely more than 1/2 cup…more like 3/4 – 1 cup.